The Meanest-Looking 356 On The Planet! Isn't it beautiful? We can only hope that it has no muffler of any sort. The car was built by Gary Emory and his guys at Emory Motorsports. 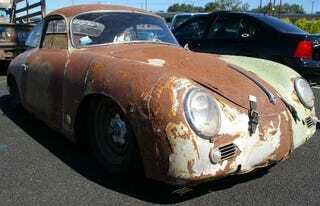 Evidently, they had a 356 that they had sandblasted prior to starting work on it. Other projects came up, and it was set off to one side. Then they needed the nose for a restoration on a Speedster, etc., etc. Once they started to work on it, my best guess is that inspired lunacy took over, with the result you see here. Basically a detuned race car underneath (check out the rise height), they left the body the way you see it. And in person, it is way cool. The whole rat-rod thing may be getting a little tired, now that every tattooed hipster with a beater Dart claims he's in full Rat Rod mode, but it's great when done right.